Polar bear skins in storage waiting to be auctioned. Zak Smith is an attorney for the Marine Mammal Protection Project at NRDC. This Op-Ed is adapted from one that first appeared on the NRDC blog Switchboard. Smith contributed this article to Live Science's Expert Voices: Op-Ed &amp; Insights. Most people don't know that Canada is the only country where polar bears are still hunted and killed to supply the world trade in polar bear skins and other parts (teeth, claws, skulls, etc.). But Canada's practice of allowing polar bears to be killed for profit when their very existence is threatened by climate change is now going to be scrutinized by the international community, which is expressing concern that such trade is not sustainable. This critical issue came into focus at a meeting I recently attended in Veracruz, Mexico, of the Convention on International Trade in Endangered Species (CITES) — the international organization tasked with managing trade in endangered species. 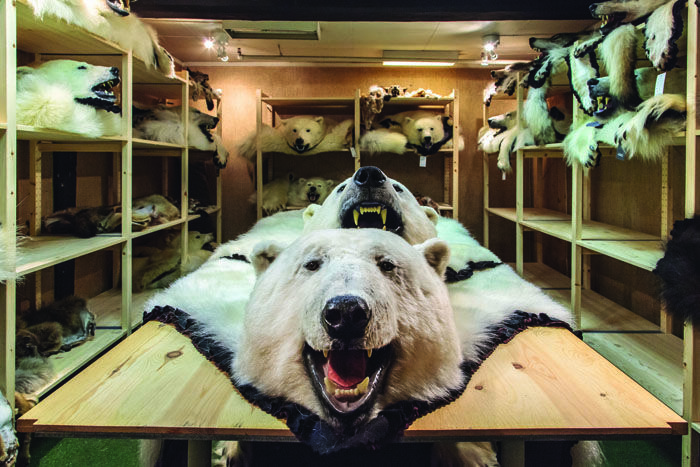 The proposal to review Canada's trade in polar bear parts came at the urging of the United Kingdom and Norway, both of which raised questions as to whether the killing of polar bears from vulnerable populations may be detrimental to the species. Their concerns are well founded. The European Union already bans imports from two Canadian polar bear populations (Kane Basin and Baffin Bay) — believing that Canada's management of these populations is unsustainable — and the United States' listing of polar bears under the Endangered Species Act in 2008 bans all commercial and trophy imports from Canada into the United States.